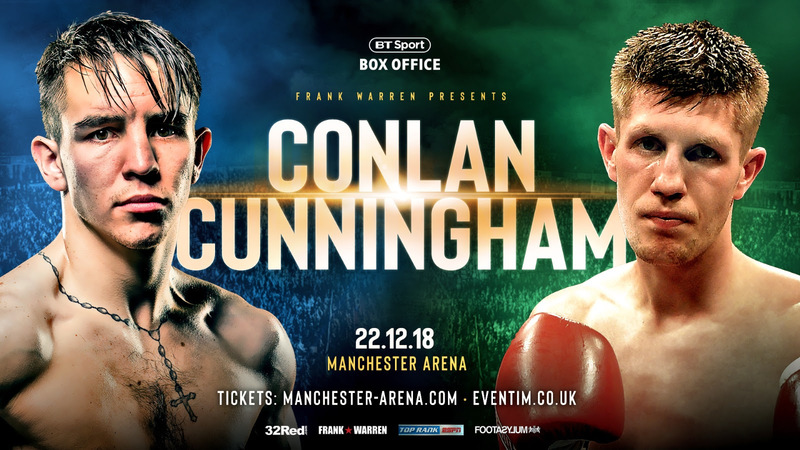 Michael Conlan will face former Commonwealth champion Jason Cunningham when he fights in England for the first time as a professional at the Manchester Arena on the massive Josh Warrington-Carl Frampton card on December 22. Featherweight Conlan joins his Belfast band of brothers, Frampton, Paddy Barnes and Steven Ward on the BT Box Office blockbuster (ESPN+ in the United States) and in Cunningham he faces his first British opposition since entering the paid code in March of last year. The experienced Doncaster 29-year-old holds a record of 24-5 and has won the Commonwealth title at two different weights – bantam and featherweight – while he has previously challenged for the British title at super flyweight. He is also a two-time winner of the English bantamweight title. Last time out in June, Cunningham won the Central Area super bantamweight title via a points victory over Paul Economides. He is now up against blue chip prospect Conlan, the former world amateur champion who will have his tenth professional fight in Manchester. In his hugely successful amateur career, Conlan was ranked No.1 in the AIBA world rankings at bantamweight with a medal haul that included an Olympic bronze medal (London 2012), Commonwealth Games gold (Glasgow 2014), European Championships gold (Samokov, Bulgaria 2015) and a World Championships gold (Doha 2015). He achieved superstar status in his homeland as one of Ireland’s most decorated amateur fighters of all time. “He is a good, experienced fighter who has been in with some top guys and I am looking forward to facing this challenge head on in only my 10th fight,” said the 26-year-old Conlan on his latest assignment. “It is something I am excited about and something where I believe I can show the best Michael Conlan. “This is maybe the first time I will be facing someone who can speak proper English! The fans will know him and I rate Jason Cunningham, but I believe come fight night I will show my class and how good I actually am. “I have been calling for stiffer opposition for a while now, although I know my fight in Belfast was a tough test (against Adeilson Dos Santos), but I quite easily outboxed that dude. “The fact that Jason is known for giving it a go and not backing down – and with it being an opponent who will bring a fanbase with him – it will be a first for me. It is something I need to experience. Since turning professional in the wake of a controversial exit from the 2016 Rio Olympics, Conlan has clocked up nine straight wins, with six of them coming inside the distance. The younger brother of Jamie Conlan made his debut as the headliner at the Madison Square Garden Theater where, after being walked to the ring by Irish MMA superstar Conor McGregor, he outclassed Tim Ibarra to get his pro journey underway. He has since boxed in Chicago, Brisbane, Tucson and twice more at the MSG Theater before getting to perform in the main arena at the Garden against Ibon Larrinaga in May. The following month he enjoyed a homecoming fight and a significant step up in class against Adeilson Dos Santos at the SSE Arena in Belfast, where he was victorious over the eight-round distance. Most recently in October, Conlan got to experience the Las Vegas fight scene where he overcame the resistance of Nicola Cipolletta and forced a seventh round stoppage at the Park Theater in his Las Vegas debut. IBF world featherweight champion Josh Warrington takes on former two-weight world champion Carl Frampton at the Manchester Arena on December 22nd live on BT Sport Box Office. Mark Heffron will now fight WBO Interim world title challenger Liam Williams in support of the main event, while Belfast’s blue chip featherweight prospect Michael Conlan (9-0) takes on former Commonwealth Champion Jason Cunningham (24-5) on the bill along with world flyweight title challenger Paddy Barnes (5-1) and unbeaten Light Heavyweight contender Steven Ward (9-0). In another middleweight addition, 7-0-1 Darlington Middleweight Troy ‘Trojan’ Williamson has also been added to the show after his thrilling draw with Jack Flatley earlier this year.